5G, the next generation wireless standard, promises to deliver an enhanced end-user experience by offering new applications and services through extremely high speeds and significantly improved latency. The excitement about the rollout of 5G networks is drumming up. Many operators have already started to set up trial networks. 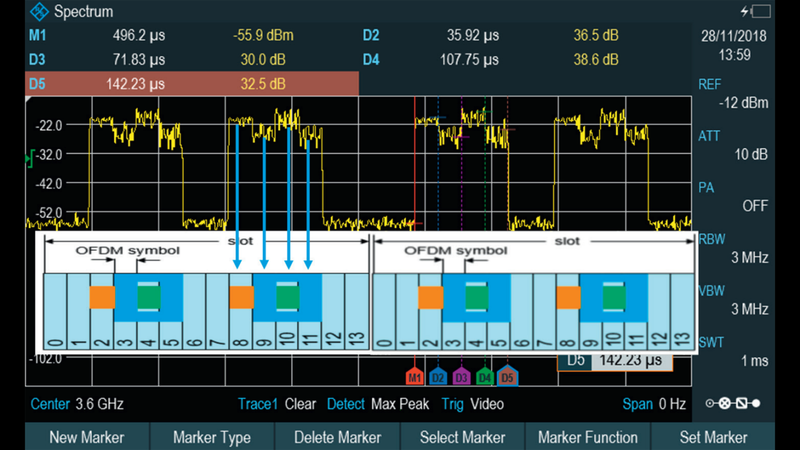 During trials and for the sake of simplicity, infrastructure providers will typically use a spectrum analyzer to measure critical downlink parameters. Based on 3GPP, there are two basic frequency ranges (FR1 and FR2). FR1 covers 450 MHz to 7.125 GHz, while FR2 covers 24.25 GHz to 52.6 GHz. The frequency trends for 5G are mainly below 40 GHz. In the frequency domain, the synchronization signal block (SSB) consists of 240 contiguous subcarriers. In the time domain, an SSB consists of four OFDM symbols. An SSB occurrence in the slot depends on the subcarrier (SC) spacing case type. Table 2 shows the SC spacing for different case types. Figure 1 illustrates the SSB sequences. 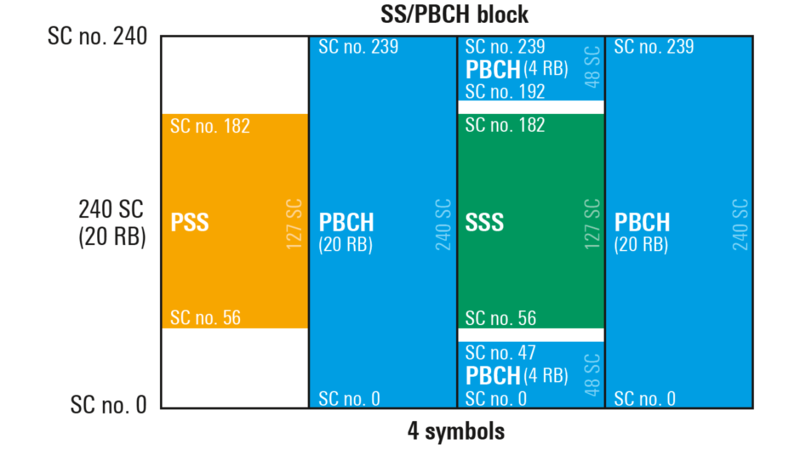 SSB is the combination of SS and PBCH, where PSS, SSS, and PBCH with associated DM-RS occupy different symbols. Weighing only 2.5 kg regardless of frequency range, the R&S®Spectrum Rider FPH handheld spectrum analyzer supports frequencies up to 31 GHz, which covers most of the 5G candidate frequency bands. With a single charge, the analyzer can operate for more than six hours. In the base model, it supports spectrum analysis measurements such as occupied bandwidth (OBW), channel power, spurious emission and harmonic distortion. 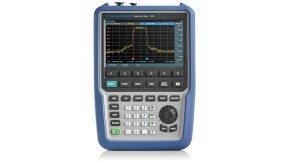 This offers fast interpretation of spectrum analysis measurements. 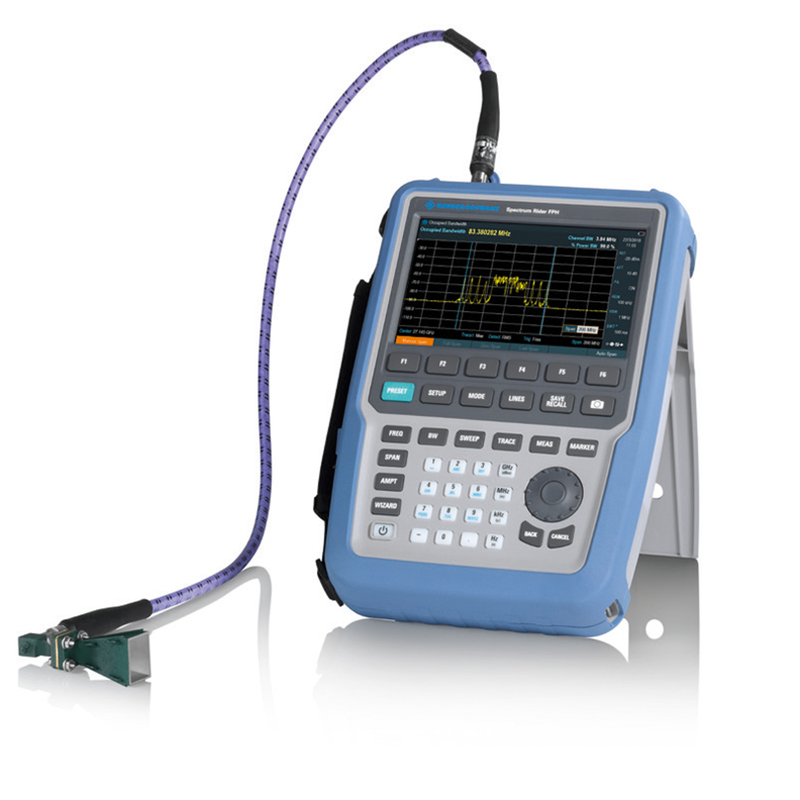 The state-of-the-art R&S®Spectrum Rider FPH is an economical, intuitive and rugged instrument. It supports spectrum monitoring, RF design validation, interference hunting and RF transmitter testing. 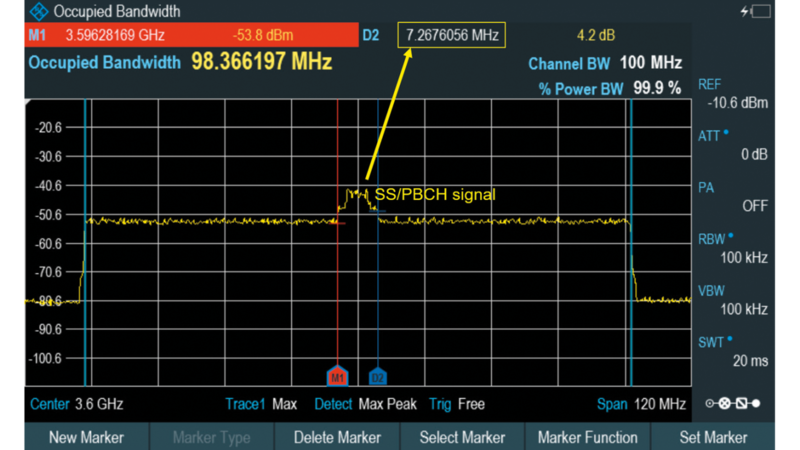 In the OB mode, the R&S®Spectrum Rider FPH auto matically displays the occupied bandwidth of the 5G downlink signal. In figure 2, the occupied bandwidth is approximately 100 MHz, matching the specified 5G channel bandwidth. The bandwidth of the captured SSB (SS/PBCH signal) also matches the theoretical value of 7.2 MHz (240 subcarriers × 30 kHz SC spacing). Figure 3 shows the 5G downlink signal in the time domain. Based on the SSB occurrence, this is easily recognized as the SC spacing case C. In line with the standard, the theoretical length of a slot is 500 μs and 33.3 μs per symbol, fully matching the transmitted downlink signal. In conclusion, the lightweight R&S®Spectrum Rider FPH handheld spectrum analyzer can quickly help to verify transmitted 5G downlink signals in the field. It requires no complicated setup and no special or expensive options.